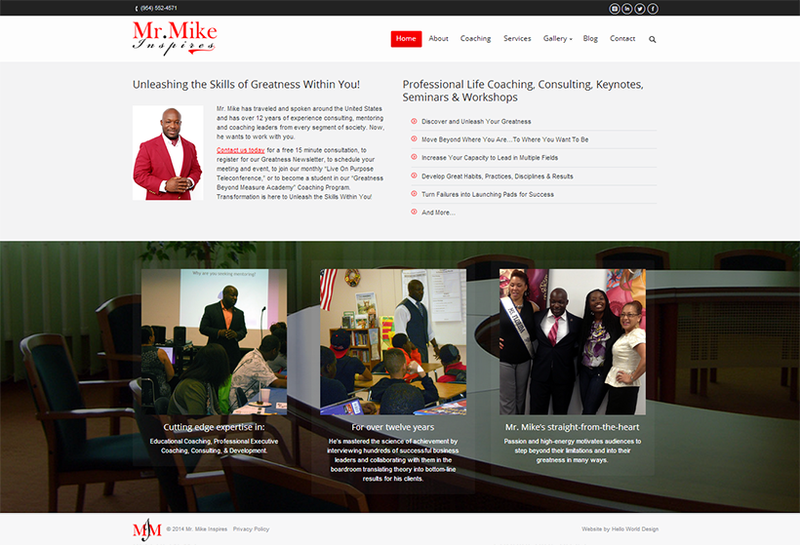 Hello World Design has launched a customized WordPress website for Mr. Mike Inspires, a business providing professional life coaching and consulting services. Mikelange Olbel, better known as Mr. Mike, has traveled the United States for over a decade speaking at seminars and workshops, giving keynotes, and providing coaching and consulting for both businesses and individuals looking to maximize their potential. In addition to his professional life coaching, Mr. Mike founded Team Saving Our Youth Inc. (TeamSOY), an organization dedicated to fostering relationships between parents, youth and the community to conquer challenges facing today’s youth. Mr. Mike Inspires has spent more than 12 years helping professionals realize their goals, so we created mrmikeinspires.com to be a responsive WordPress site that would help Mr. Mike Inspires realize its own goals. The site has a user friendly design, with features such as a parallax scrolling homepage, top navigation, easy-to-find detailed information on company services and a gallery of Mr. Mike’s work. The site also has a blog and social media links, making it easy to stay current on Mr. Mike news, as well as a search function. We used a responsive web design that works seamlessly on the WordPress platform and has an optimal viewing experience on a wide range of web-enabled devices.